ASEAN has witnessed enormous growth since it was founded half a century ago. Today, the 10-country Association of Southeast Asian Nations forms the world’s third largest labour force, its fifth largest manufacturing economy in value-added terms and its seventh largest market. The region’s 4.4% growth (CAGR) during 2012-16 outpaced that of developed countries such as the United States and Germany. But it trailed that of neighbouring China. As the region looks ahead to the next 50 years, managing the disruptive impact of the Fourth Industrial Revolution must be high on its agenda. ASEAN’s competitive advantage stands at the crossroads. The region faces three main challenges in maintaining its attractiveness as a manufacturing base. Firstly, many ASEAN countries are perceived as being less responsive to technological change. They fail to accelerate the pace of transformation needed to sustain their manufacturing advantage. Some ASEAN countries still rely on basic manufacturing. Their rates of value addition are significantly less than those in the more advanced industrialised economies. Secondly, low labour costs, which have traditionally been a source of competitiveness, are neither defensible nor sustainable. 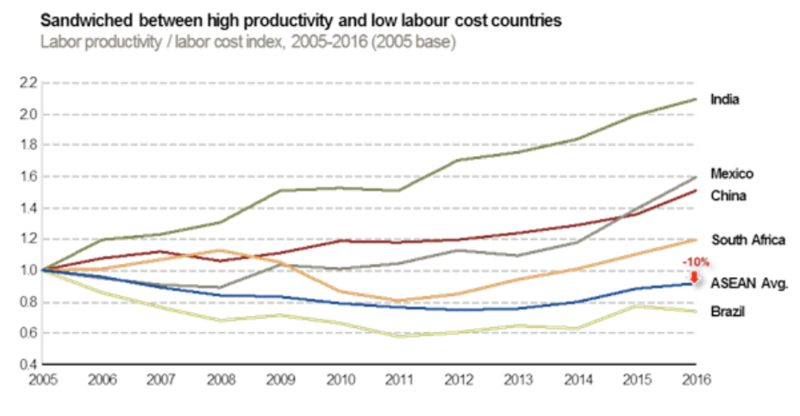 ASEAN members increasingly find themselves sandwiched between countries with higher productivity and those offering even cheaper labour. Finally, new manufacturing technologies that help to increase productivity and reduce costs are emerging as a new source of competitive advantage around the world. In short, the Fourth Industrial Revolution (4IR) is rewriting the rules of manufacturing. Disruptive technologies like artificial intelligence and big data analytics are transforming global production systems. Their impact is being felt on everything from factory processes to the management of global supply chains. As automation gathers pace and its costs plummet, cheap labour will no longer remain a sustainable and effective strategy for attracting investment in manufacturing. There are also other potential threats to ASEAN’s competitiveness within the broader Asian region. To the west, countries such as India and Bangladesh are transforming at a significantly faster clip. A recent study of the 30 largest Asian cities by Oxford Economics has projected that Indian cities will see the region’s fastest economic growth by 2021. To the north, China is starting to regain some of the cost advantage that it had lost to Vietnam and Thailand. China has also recorded strong improvements in higher education, worker productivity, and 4IR technological readiness and application, compared to its Southeast Asian counterparts. It has launched its China Manufacturing 2025 Roadmap to guide the country’s industrial modernization. ASEAN countries will need to quicken the pace of their transformation or risk losing manufacturing investments to China. While they have made efforts to improve their business environment and stepped up investments in infrastructure, these need to be expedited. New technology must be adopted and workers must be upskilled to handle them. Failure to do so will certainly result in the loss of manufacturing investments and jobs. The UN’s International Labour Organization has identified Vietnam, Cambodia and Indonesia as having the highest number of workers at risk from automation. While ASEAN currently produces a little more than one tenth of global electronics, investment in manufacturing more advanced products such as semiconductors has lagged behind Taiwan, South Korea, Japan, and even China. To increase their share of this growing pie, member countries will need to grow their advanced manufacturing capabilities and establish policies to attract such investment. The pace of deploying newer technologies is bound to accelerate, as the forces of supply and demand make it easier to apply such technologies across production networks. However, in ASEAN, the deployment of 4IR technologies has mostly been undertaken by multinational corporations and larger local enterprises. Therefore, ensuring that small and medium enterprises participate in such transformation, and that the whole labour force is upskilled, will be key to achieving a more inclusive and broad-based growth. ASEAN countries should also consider mutual collaboration as a means to accelerating transformation and overcoming their shared challenges. They should leverage each country’s strengths and create synergies among themselves. This would increase the region’s overall attractiveness in terms of economic competitiveness and strengthen relationships among the member states. Such collaboration is not entirely new to ASEAN. It is already aiming to create an ASEAN Economic Community (AEC) by bringing down trade barriers and establishing a common market that would eventually allow unrestricted flows of goods, capital and labour. While regional economic integration remains a work in progress among countries that have diverse economic and political systems, the AEC blueprint must include 4IR collaboration as a key component for enhancing competitiveness. Broader and deeper collaboration among ASEAN members should aim to achieve three clear outcomes. Enhancing supply markets to ensure availability and application of 4IR technologies; promoting demand to increase awareness and adoption of new technologies; and strengthening enablers, such as human capital reskilling and common digital infrastructure, that reinforce the supply-demand ecosystem. Private sector involvement will play a critical role in achieving these outcomes.